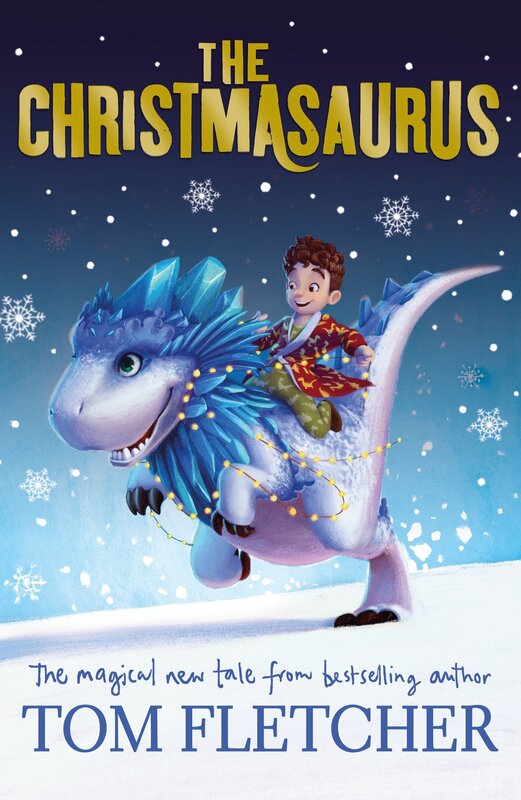 The Christmasaurus by Tom Fletcher CHARMED ME, unexpectedly. I was a little bit skeptical about how dinosaurs relate to Christmas. However, I was willing to give it a whirl. After all, this is a season for giving things a chance, right? So with exactly 48 hours until I was on a blog tour for it, I cracked open The Christmasaurus. Nothing like a deadline and intense pressure to get the reading wheels moving. Friends, this book took me a couple chapters to get into but it was SO enjoyable. The Christmasaurus is about a boy named William Trundle. William is a wheelchair user and lives with his father. His mother is dead. He loves dinosaurs more than almost anything in the world. So, one year for Christmas he asks Santa for a dinosaur. William gets what he asks for, accidentally. You see, he was supposed to get a stuffed animal, but a real dinosaur shows up instead. What happens next is a magical story of friendship, loneliness, and kindness. There is a hunter and his dog. There is a bully. Santa and his elves play a pretty prominent role too — although I could take or leave the elves. Basically if there’s Christmas involved and it comes in my mail, I will read it. The #christmasaurus was a cute book. I’m actually going to hang onto it and read it to Teddy when he’s older. Right now though I consider it a miracle that I could hold his attention with The Polar Express for a few pages. So, as I said, Tom Fletcher’s The Christmasaurus had kind of a slow start to me. I almost gave up on it. Then I thought, hmmm, I probably won’t end up liking this book too much. It is a little bit too juvenile for me. I guess a switch just flipped part way through. Maybe it was after the elves and their weird rhyming was over and we got into the meat of William’s story? Regardless, William and his dad are treasures. They’re genuine and have a whole lot of love and care for each other. So, that’s when I thought to myself, wow, this is a pretty decent story, I would like to read it to Teddy someday when he’s older. ALSO, the illustrations are fantastic! They do not detract from the story at all and instead really enhance the book. The Christmasaurus is OVER THE TOP with Christmas spirit. William’s dad is into Christmas like all year round. He has this saying about how the day after Christmas is 364 days until the next Christmas. And plus, it nails that melancholy that hits when Christmas is over. Also, we have Santa and elves and changes of heart. All the elements are definitely within this book which add up to ALL SORTS OF SPIRIT. Added to my TBR. Love the cover and premise. Great review, thank you! This sounds like a wonderful read! If I hadn’t read your review, I probably wouldn’t have picked this one up. I’ve never thought of dinosaurs and snow, though I’m sure it must have happened! Right? Thanks for sharing this one, April! Also, have you had a chance to read Wundersmith yet?? Ahh! So good!